Your website up-time should be as important as traffic to you as a dedicated blogger. Fortunately, there are free services that lets you monitor your website’s up-time and informs you whenever there’s a downtime. We will share the best three (3) free tools to monitor your website’s up-time as a blogger and/or internet marketer. These tools should work for your blog (or website) irrespective of self-hosted or third party hosted blogging services. Do note that third party hosted blogs hardly records a downtime longer than 2 minutes unlike self-hosted blogs that needs the best hosting companies to record an above 99% up-time monthly. 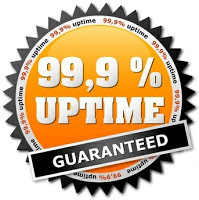 You’ll get to see how good and reliable your hosting company is by subscribing to any of these recommended website uptime monitoring services. freewebmonitoring.com is one of my most loved tool for monitoring the uptime for blogs and websites. You get notified once there’s a website downtime, website error and complicated http header codes. freewebmonitoring.com lets you add more than one website address, this way, you can monitor all the blogs you own from one account. With a freewebmonitoring.com subscription, you’ll get weekly email alerts on how many times a day your website goes down or not. Jetpack plugin brings all the features of third party hosted wordpress.com to self hosted wordpress.org at a single click. The Jetpack website monitor is a module that can be activated from the “jetpack settings” window and works only for self hosted WordPress blogs. Pingdom is another free tool that lets you monitor the uptime of a single website and gives recommendation for optimizing your blog for performance and speed. With a pingdom account, you will get alerts on downtime, receive performance and uptime stats as well as troubleshoot downtime and/or website errors. You have seen the free tools that lets you monitor the uptime of your blog and websites, it is advisable to go with one and take actions where and when the need arises. Always use optimized themes and plugins and do not forget to go with the best hosting solutions suitable for your kind of website/blog. Feel free to discuss other options using the comments section.